Science Fair projects have become more detailed and sophisticated over the years due to the fact that students have a greater access to STEAM (Science, Technology, Engineering, Arts, Mathematics) related classes and instruction. 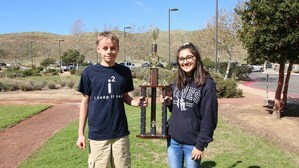 Many Hemet Unified students were recognized for their advanced projects, but two HUSD students will advance to the state competition. These two students built upon research from Massachusetts Institute of Technology (MIT) scientists in possibly preventing Alzheimer’s disease. Krystal Horton and Tanner Packham, Western Center Academy students, worked together to further expand upon the research by director of MIT’s Picower Institute for Learning and Memory, Li-Huei Tsai and her team. Based on the research that was released, it was identified that when a specific frequency is exposed through one of your senses on a regular basis, the plaque that builds upon the brain (beta amyloid plaques, which is seen in Alzheimer’s disease) is reduced. The duo played to their strengths to create this project. Horton worked on the research surrounding the project and Packham was able to create their solution in order for them to put it into practice. After about six months of brainstorming possible solutions, the two decided to create a vest that would release the specific frequency declared in the MIT scientists research. In the original research, the scientists used LED lights to flicker at 40 hertz to reduce plaque. Horton and Packham thought that this approach could cause a challenge to recipients who suffer from seizures so they created a vest that would administer this frequency. The goal is to have these frequencies administered on a regular basis to help diminish and/or eliminate the plaque that can build upon the brain and they felt that a vest would be easier to use. Horton and Packham said they would love to meet the MIT scientists who created this research so they could present them with their findings. Packham, who was recently accepted to MIT, said he would like to meet them on one of his upcoming visits to the campus. Horton and Packham's project received fourth in the state level competition and will be advancing to the International Science and Engineering Fair on May 13 in Pittsburgh! Good luck to both of you, we know you will represent the Hemet community well!